Cabbage Hall Dairy. We deliver direct to your Home or Office, we also supply to some catering establishments. Supplying Grahams Family Dairy products with other fine dairy produce available. Not a large organization, we pride our self's on our customer care. Established in 1936, and a family business delivering in the Glenrothes / Kirkcaldy area in Fife Scotland. Our web-site is primarily set up to provide our existing customers with on-line services and information. contact us for guest login. All Prices Advertised on our site are for customers who are registered with us. If you are not but would like to find out more you can by using this Link: Apply Online. We always aim to offer reliable service and good value, Membership is limited. If you are at present a customer of Cabbagehall and are interested in Online services let us know and we will set your account and services to live so you can access not only your order but your previous purchases. With Online Payment, receipts will be issued, refunds also available. All transactions are on a secure servers. ( World-pay or Pay-pal ) Discounts are only offered to existing customers, prices advertised on the site in milk section are priced as one unit or product. Cancellation of on-line, if you prefer your current payment method. Refunds Available at Discretion of Management. There has been a major increase in interest for produce direct from the Farm. The consumer and the farmer need to have a more direct relationship, As supermarkets are well placed and they are better able to service a large amount of the population, this is good and necessary. we hope to offer a personal door step service and with fuel costs its not always convenient to pop back to the super market if some thing is forgotten. 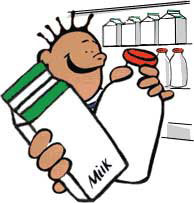 with no minimum order policy we can drop off any forgotten items with you milk deliveries. We believe that a reduction in food miles makes a lot of sense and to make local farmers more accessible to the local population, we aim to do this in a small way. And the Internet is a good way of achieving this so - Good food for a Good Price.